Attention conservation notice: People emphasize different aspects to Measure S in their discussions, and those differences reveal important things about what people think about development and politics in Los Angeles–and those differences should be really interesting to the YIMBY folks. Yesterday I stirred folks up by telling them to stop lecturing me on the supply effects of Measure S, for God’s sakes, because a) I already understand their argument and b) I think they are probably right but c) I think the supply-side framing misses much of the critique that at least some members of the Measure S coalition are making about development in LA. Of course, since I mentioned Measure S, it immediately meant I had to sit through 1,001 grumpy Twitter comments about MOAR SUPPLY and HOW DARE I act like that doesn’t explain everything and I MUST BE A ROTTEN, ROTTEN person and support Measure S, and I’m a sexist because I made a snotty crack about the legion of smartest boy urbanists who inevitably come out to yell and scream. After, don’t men get to have OPINIONS, you mean, mean lady? WHAT ABOUT THE MENZ? First of all, if I invent the Mean Nasty Lady Feminist Gun today that, when aimed and fired at various and sundry Male Urbanists With Opinions, silences them and immediately transports them into exile forever to the Inland Empire, there will still be one thing that urbanism and urban politics will not run short of, and that one thing will be male opinions about cities. Or anything else. Fret not. Second of all….I do enjoy it when people debate the issues with me. The ad hominem is childish and pointless; my mother is already here to point out my many personal flaws, and the ones she misses get covered variously by undergrad evaluations and senior faculty. When I post what I am thinking, I inevitably have smart people respond along with the ACTUALLEH, THE FACTZ ARE…. and I get to learn from both the smart people and sometimes the arrogant loudmouths because even they can be right at times. So what do I really think about Measure S? Both sides claim that they care about affordability, and both sides claim the other side is corrupt and disingenuous. On the pro side, it’s the development process that is corrupt. On the anti side, it’s people yelling and screaming about Michael Weinstein and how he’s a bad guy and misusing AIDS Foundation funds. Whether Weinstein is a good guy or a bad guy means diddly about whether Measure S is good or bad policy. Honestly, if Pharma Bro came out against Measure S, would it suddenly magically become good policy just because a lousy person advocates a position? No. It wouldn’t. To be clear, I do think Measure S is bad policy. All my friends on the pro side will be sad to read this, but from my standpoint, for all the posturing and claims about What Measure S Will Do Both Good and Bad…I don’t think we know what it would do, and what we can pin down with some confidence is not good. Specific components, like the moratorium and the parking provisions, obviously there as a sot to specific project opponents, are both bad ideas. The unintended consequences for small businesses of the parking provisions loom large. I am one of Don Shoup’s students, after all. Measure S may be bad policy, but I am not sure that it is bad politics. Yes, we have a ballot box initiative that we have to vote on in a couple weeks, that’s one thing. Another simply is that the various interests on display with Measure S are worth paying attention to because they might be incorporated into a pro-development coalition if they see enough of what they want alongside what the YIMBY folks want in future initiatives. Of all the writing about Measure S, Christopher Hawthorne has penned some important pieces in the Times. I found this one, on the decades of anti-growth politics, to be particularly intriguing. If Hawthorne is right, and I think he is (with a few quibbles that don’t really matter), then Measure S is simply a new incarnation of anti-development interests that have dominated LA for a long time. If he is right, then Measure S could stand a good shot at passing, and even if it doesn’t, Measure S is simply a contemporary skirmish in a much longer conflict about what LA is, how it should invest in itself, and how people here should live. 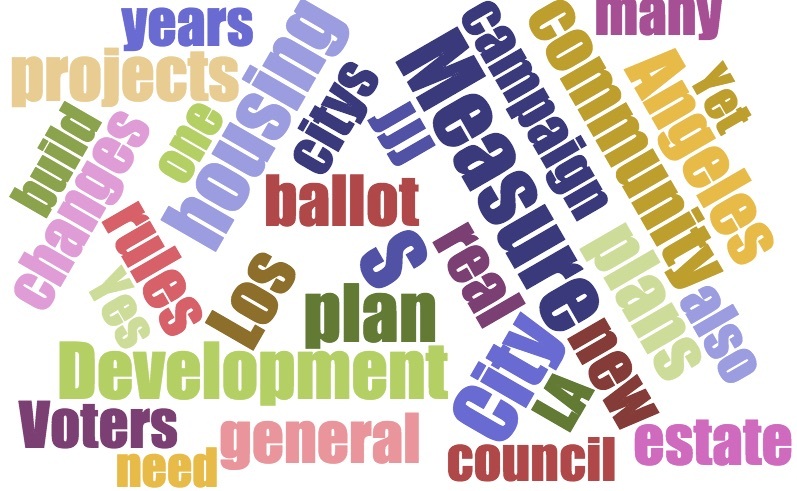 In examining the pro side of Measure S, there seem to me to be threads of the “pro” narrative that reflect interests which are not necessarily entrenched with strict anti-growth interests. That is, they could be split from the existing pro-Measure S coalition if they see their interests reflected in future proposals. That strikes me as worth knowing for governing land in LA. Enough blather. Let’s look at some word clouds. These aren’t the best, but I have some more work to do before I can get you really good, analytical visualizations, and I do have a day job, ya know. Nonetheless, they do show some variations in emphasis around the issues that I think are useful to discuss. These are the top 50 words from the various print media I’ve been able to collect. I do not have the videos transcribed yet, and there is a lot of material there. This is the corpus of writing from the LA Times. Now, the Times has taken a no position on S, and it has run multiple op-eds from opponents like Shane Phillips. However, since I analyze what Shane has written separately, his op-eds for the Times are in his text corpus, not here. Some words to note here: development, plans, housing, community. I’ve sorted the “pro” and “con” comments from ALL the media sources I’ve scraped for the study. This also includes CityWatch articles and blog posts from around the web, as well as what I could scrape from the Times and the Sentinel. Quite a bit of overlap, right? 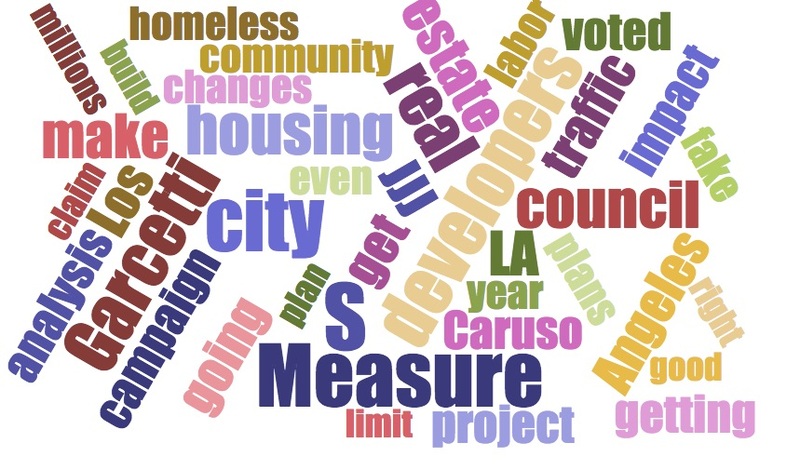 But different emphasis on things like community, plan, planning, and some phrases that don’t really appear in journalistic accounts or blog posts: Garcetti, traffic, fake, Caruso, developers (not development). Lots of the commenters direct their anger about development at the mayor and specific developers–not necessarily growth. Nonetheless, traffic is a hot-button word, and it’s a cover word for anti-growth (defines growth via its potential negative externalities and nothing else, thereby trading on stigma). Interestingly, however, this corpus is the only one where the idea about “labor” pops up. I don’t know what that means, if anything. Going to have to go dig through. 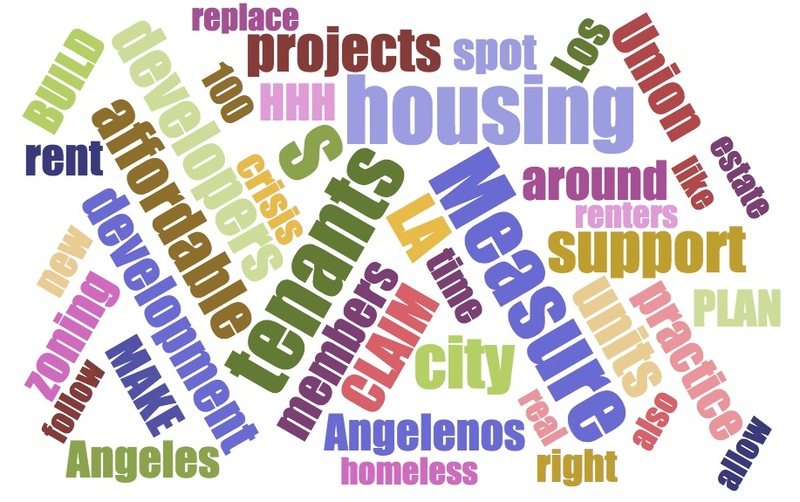 This word cloud is the smallest corpus–just the materials from the LA Tenants Union Statement in favor of S, and the comments I have been able to scrape in response to the Statement. Please note: unlike the “pro” commenters above, these folks do not mention the mayor, specific developers, traffic…etc. 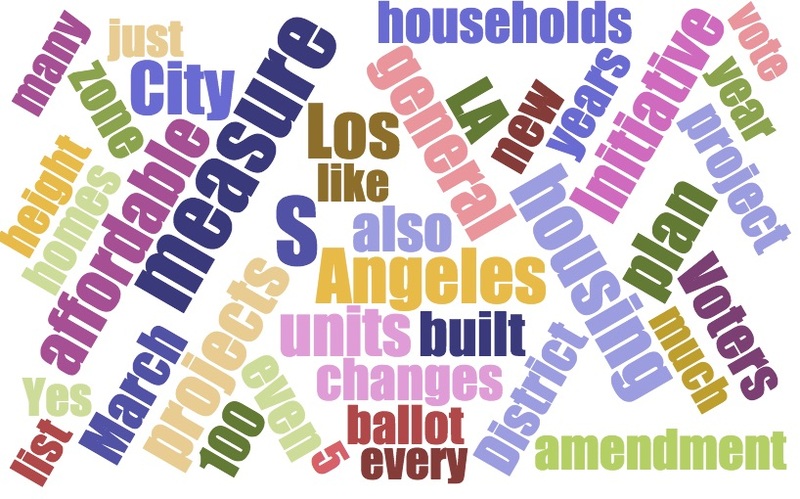 These are groups with ostensibly “pro” positions on Measure S, but they emphasize different aspects of Measure S. And, btw, like Shane Phillips, an opponent of the measure, the statement emphasized affordability. Now, in looking at the “pro” comments above, and the “pro” comments here from Tenants Union Statement and various comments…are these folks saying the same things? We need to do more analysis, but I think this preliminary evidence is that they are not, in general, supporting the measure because they have the same interests against development. And that strikes me as important not necessarily for Measure S, but for the long-term governance of land development in LA. There is a lot here that overlaps with the Times and with…of all things…the Tenants Union. See where I am going with this? Cool things about Shane’s writing: he emphasizes households and homes in ways that none of the writers do. Lots of overlap with Shane, despite their occasional snarks at each other, and two words emphasized here and nowhere else: zoning and land. What does any of this prove? I honestly don’t know yet. I need to go through and *really* analyze the material–it’s possible that the discussions highlight similar terms but do so with entirely different value-framings. But I do think it’s suggestive of something important: that is, Measure S, with all its moving parts, is both ambiguous enough and ambitious enough that people look into it and see what they want they want to see, pulling out and emphasizing various things while downplaying others. In that, however, I do think these little explorations show that the “pro” side is hardly one-note and hardly just self-interested, no-growthers. They are certainly in the coalition–the comments scraped from the web seem to show that. It looks to me, however, that their concerns do not really align all that well with Platkin’s or the Tenant’s Union, even if they have formed an campaign coalition here. Which is my point. The most likely way to sustain victories from things like JJJ and counter straight-up NIMBY-related anti-growth is to build bridges with folks like the Tenants Union who are, for the moment, advocating for Measure S because they want things to change and are worried about the *effects* of development, but whose language and interests do not necessarily center *specifcally* on stopping development entirely. And as important as MOAR SUPPLY is…it is only one argument, and I’m not sure how well it has really worked to build bridges between the YIMBY folks and the I’m-Worried-I’m-Going-To-Get-Displaced folks. 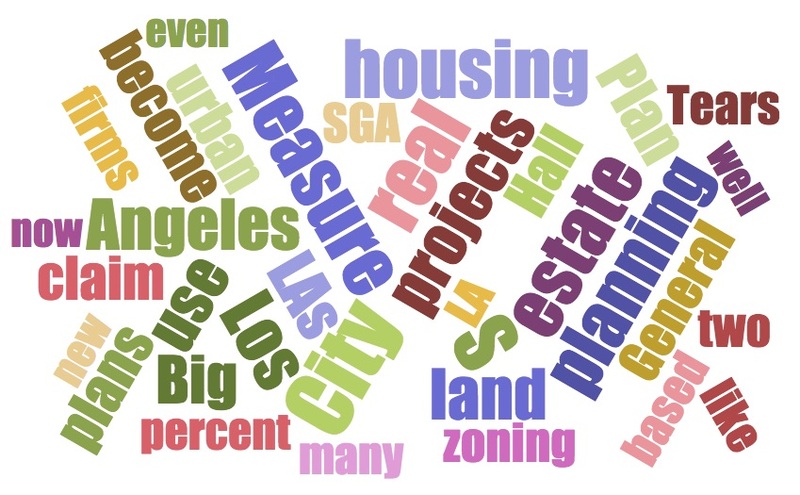 What is the Post-Measure S Agenda for Inclusion Among LA Urbanists?